Since Toy Story (1995), the standard bar for animated features has been set so high by the likes of CGI pioneers Pixar and Dreamworks, as well as the more traditional animations from Studio Ghibli and Aardman, that many new films fail to make much of a lasting impact. In twenty years’ time we will remember The Incredibles (2004) and Princess Mononoke (1997), but will anyone be going back to Bee Movie (2007)? The proliferation of the requisite technology to make such films has allowed them to be made more quickly and inexpensively, while the leading animation studios attempt to outdo each other with newer flashier effects. Last year’s WALL-E (2008) represents the current high-water mark, but no doubt five years down the line it will look horribly dated compared with the latest releases. What makes the likes of the best of the Ghibli and Pixar films is not how cutting-edge their graphics were at time of release, but the quality of their stories. Into this market is thrust Coraline, being hailed by some as ‘the best 3D movie of all time’, and heralding a new dawn for the cinemagoing experience. If this is not a reason to get suspicious, I don’t know what is: showcases of new technology, while undeniably technically impressive, seldom make for lastingly great films. Smell-O-vision anyone? Coraline, though, comes to us from good stock: director Henry Selick previously helmed the superb, if misleadingly titled, stop-motion classic Tim Burton’s The Nightmare Before Christmas (1993), a masterpiece of darkly macabre imagination recently reissued in 3D. Furthermore, the story itself comes from the pen of revered fantasy author Neil Gaiman, creator of the Stardust (2007) universe amongst many others. The story begins with the young Coraline Jones and her parents moving cross-country from Michigan to Oregon into a house labelled the ‘Pink Palace’. Her mother and father are both gardening writers, both rather drab and both too absorbed in their work to pay much attention to their daughter. 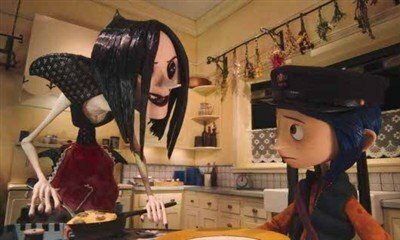 Friendless, save for one strange local boy named Whybourne, Coraline spends her time exploring the house’s large garden and many rooms, as well as acquainting herself with her new eccentric neighbours. On one of her explorations, she finds a small door which has been covered over with wallpaper, but upon opening it, she discovers whatever behind it bricked up. However, awoken one night by a jumping mouse, she is led back to the door to discover that it leads via a tunnel to a replica of the real world, but where everthing is more fantastical and exciting. Replicas of her parents are more loving and dynamic, cooking sumptuous food and playing games with her rather than ignoring her. The ‘Other World’ garden, far from the derelict real world equivalent, is transformed into an enchanted living forest. All of this wonder is of great excitement to the previously bored Coraline, who soon becomes a nightly visitor to this strange wonderland. However, all is not well there; all of the characters there sport the extremely sinister look of having buttons sewn in where there should be eyes, and the young girl soon learns that if she wants to stay in the Other World that she must have the same done to her. When she refuses, it soon becomes clear that her Other Mother is not as kind and benevolent as she seems, and that Coraline is in big danger. The first thing to say about Coraline is that there are many moments where it is truly visually breathtaking. Ignoring the 3D element, which though at times is impressive can too be distracting, there is so much to feast the eyes upon in the Other World that it can be overwhelming: troupes of dancing mice, plants and flowers exploding into bloom, and all manner of miscellaneous creatures and gadgets which fire the imagination. The curious neighbours, both in the real world and Other World, are similarly bizarrely grotesque and entertaining. It is pleasing to note that this visual splendour is not let down by the story. Initially things in the real world are slow to start, perhaps too slow for children raised on Transformers (2007), but once the Other World begins to become more fully formed the narrative pace picks up, particularly as the urgency of Coraline’s situation becomes apparent. Some critics have suggested that the film is in fact too dark for children, and whilst this may be true for much younger viewers, I think that the PG certificate just about gets it right. My initial fears about Coraline being merely a vehicle for 3D technology proved to be unfounded. Brush aside the gimmicry and here is a vibrant, modern spin on the classic Through the Looking Glass tale with enough darkly visual delight to make children of all ages think twice about turning the light off at bedtime.